I am 9 months and 4 days today and we finally finished the nursery this weekend! 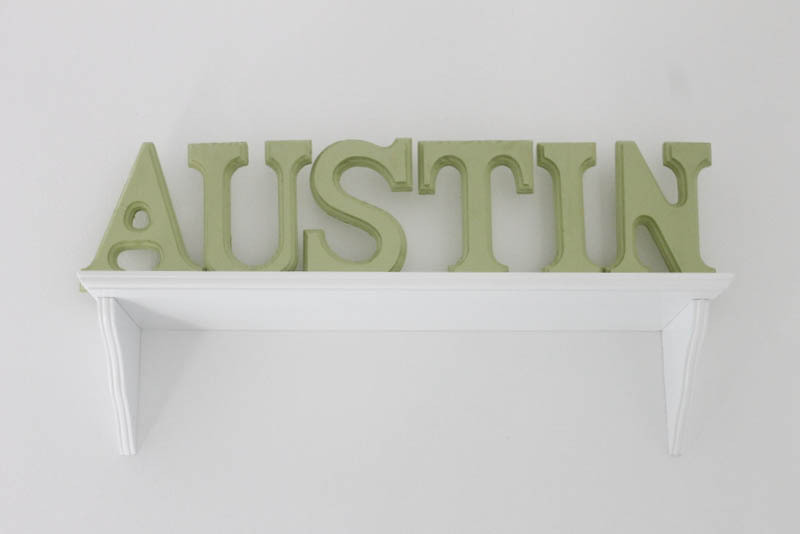 The only thing left to do was paint the “Austin” letters and get them screwed into a board so they would stand up straight on the shelf we installed. I painted them (with a free sample of Valspar paint in “Herb Cornucopia“) and Nick got them onto the board. They were a gift from Austin’s grandparents and they were the perfect finishing touch. Here is the changing table that Nick made out of an old white dresser we had. Again he just painted two even wood boards, sanded them down and then screwed them into the top of the dresser (in order to hold a changing pad secure on top). I finally settled on this Lolli Living “Animal Tree” crib bedding set. It was really hard for me to pick a theme. Everything was animals or trucks or boats and I just couldn’t make up my mind. I liked that this set had a monkey but wasn’t over the top monkeys everywhere. There was an owl and a lion too! Speaking of monkeys, remember this guy? He has been with us since 16 weeks (read week 16 here). I’ve played the Snugamonkey music almost every night for baby Austin. We love the whole Snugamonkey line and have the bouncer and the swing too! The owl print actually came off of a gift bag! It was a perfect color match with the bedding set and the paint and it fit perfectly in the 5×7 frame. I have one more frame to hang but I want to wait until I have a family photo for it. We got really lucky this room had a closet with shelves already. It’s on the smaller side so another dresser for clothes would have been a tough squeeze, but all his little bitty baby clothes fit easily in here. I wander into his room a couple times a day just to look at all his little things. They make me happy. This outfit reminds me of something Nick would wear actually. I can’t wait to bring my little man to church in this one. The gorgeous lamb blanket was hand made from Nick’s grandma. All the Cordero babies get one. Another thing I love about his room is the light that comes in through this window. The white chiffon curtains helped to create the bright, airy look I was going for. I really, really wanted to get the chair by the window so I could rock him and stare out the window but it just didn’t look right there. We will have to toughen up the look of this room as the munchkin gets older. We can change the aqua paint to a darker blue and make everything more masculine. For now though … it looks exactly how I envisioned it. It’s adorable! Holy! I can’t believe you’re already at 9 months. I feel like your pregnancy has flown by. This is so beautiful, in so many ways! I would have never thought to put those two colors together but I love it! So precious. You guys did a great job! Would you mind telling me what color paint you used? I love this aqua! The Seahawks haven’t been particularly effective in drafting interior defensive linemen under Carroll and general manager John Schneider. Instead, they’ve found success with veteran free agents like McDaniel, Kevin Williams, Cliff Avril and Michael Bennett +AFs-url+AD0-http://www.kankenbackpacksaleuk.com/+AF0-Kanken Backpack Sale UK+AFs-/url+AF0- in recent seasons at marginal cost. Rubin could be the next in that line of key free agent acquisitions for Seattle. At Baltimore, the Ravens kicked a field goal and then took the lead on a 16-yard touchdown pass from Joe Flacco to Torrey Smith with 7:33 left. Flacco’s 2-yard TD throw to Kamar Aiken clinched it. INDIANAPOLIS (AP) +lR8-?Andrew Luck keeps searching for answers to a confounding slump. I just want to tell you that I am newbie to blogging and site-building and honestly enjoyed your web blog. Probably I’m want to bookmark your website . You absolutely come with fabulous writings. Cheers for revealing your web-site. It appears there are websites and blogs committed to lots of tasks, such television, music, lives of celebrities, etc. But I truly can not find websites and also blog sites devoted to analysis, however an afterthought when it concerns pastimes … Anybody know some really preferred and also great ones? Timeless and existing literature are both trendy with me, given that I check out both … Many thanks so much! =o-RRB-. I am intending to transfer to Australia completely. Ideally, my migration process will be finished this year as well as I will relocate the beginning of 2011. Can a person recommend some outstanding sources as well as blogs about making the prepare for resolving in Australia?.